What is Medicare Part D, and Do I Need It? Medicare Part D offers prescription drug coverage to all Medicare recipients through various plans run by insurance companies or other private companies approved by Medicare. Each plan is different, in that it has different costs and different levels of coverage for certain drugs. There are two main ways to obtain Medicare prescription drug coverage. Learn more about Medicare part D here. As a recent Washington Post article points out, a diagnosis of Alzheimer’s Disease or early onset dementia can derail even the best financial retirement plans. With 5.4 million Americans now living with this incurable disease, and thousands more expected to be diagnosed in the near future as the Baby Boomer generation turns 70, addressing the financial realities of the disease has become increasingly important. Learn more about facing financial reality with early dementia here. Michigan Achieving a Better Life Experience (MI-ABLE) accounts allow to save funds for disabled individuals without fear of jeopardizing their eligibility for certain government benefits and assistance programs. Learn more about MI-ABLE accounts here. A will is a legal document that only goes into effect when you pass away. The terms of a will direct how your assets should be distributed to whomever you designate. Beneficiaries of a will could be surviving relatives, friends, colleagues, and even charities. Learn more if you should have a trust or will here. Beneficiary designations are one of those issues that many people forget about after they have had a significant life change. Plus, if they do consider the issue, they are likely to view it as inconsequential; after all, won’t the rest of your estate plan make up for the failure to change your beneficiary on your life insurance policy? Learn more about keeping your beneficiary designations up to date here. As a general rule, Medicare does not pay for the long-term room and board expenses incurred when it is necessary for you to stay in a nursing home or other long-term care facility simply to receive custodial care, or help with daily activities like dressing and bathing. Learn more about if Medicare will pay for you to be in a nursing home here. Is It Worth It to Get Long-Term Care Insurance? Long-term care insurance is an insurance policy that is specifically designed to provide coverage for an elderly individual for a period of 12 months or more of necessary services in a nursing home or other long-term care facility. The policy covers necessary diagnostic, therapeutic, rehabilitative, or personal care services, usually when the individual becomes ill or injured. Learn more about if it's worth it to get long-term care insurance here. Many seniors have received a lot of misinformation about Medicaid eligibility. One of the most common myths is that if you qualify for Medicaid in order to receive nursing home care coverage, then you immediately must forfeit your home to Medicaid. This is simply not the case, although it may be a different story after you pass away. Learn more about if Medicaid will take your home here. The Social Security Administration (SSA) recently announced its intention to implement a cost-of-living adjustment (COLA) for Social Security benefits recipients in 2017, which measures a whopping 0.3% increase. This COLA will increase the average monthly Social Security benefit to $1,360, which is an increase of about five dollars over 2016. Learn more about social security increase in 2017 here. If you want your affairs to be handled in a certain manner or if you want to be cared for in a certain way, then it is crucial to share these wishes with your loved ones, preferably both in person and in writing, so that your family members know what you want should your health and mind start to deteriorate. Learn more about end-of-life estate planning lessons here. Advocates for senior citizens have praised the recently issued regulations from the Centers for Medicaid and Medicare Services (CMS), a federal agency that establishes policy on a wide variety of important matters relevant to seniors. Learn more about pre-dispute binding arbitration here. As individuals age, they necessarily begin to encounter health issues that necessitate an increase in care. Medical emergencies, decreases in mobility, and cognitive decline all may hasten the aging process. However, when individuals are facing their final days, they often prefer to remain in the comfort of their own homes, although perhaps with the assistance of home health care agencies or others. Learn more about how end-of-life care varies by region here. If a person dies without a will in the state of Michigan, or dies intestate, then the person’s assets are divided in accordance with Michigan intestacy laws. These laws set forth a particular order, or succession, in which family members will inherit assets from a person who dies intestate. Learn more about what happens under Michigan law if you die without a will here. An incentive trust is designed to encourage or discourage certain behaviors in its beneficiaries by using the distribution of funds as a tool to exert control over the beneficiaries. In other words, this type of trust provides an inheritance for certain individuals, as long as they comply with certain conditions, as set forth by the terms of the trust. Learn more about incentive trusts here. Do I Need a New Will Because I’ve Moved to Michigan? As a general rule, a will that is legally valid in any state also is valid in the state of Michigan. This means that if you created and signed the will in accordance with the laws of the state, your will is likely valid in Michigan, as well. Learn more about wills from state to state here. What Happens to My Husbands Benefits if He Passes Away? There are a number of different VA benefits available to veterans and their surviving spouses. The most commonly-known VA benefits program is the monthly service-related disability benefit, which veterans receive during their lifetimes, based on the extent and nature of their disabilities. Learn more about VA benefits after death here. A reverse mortgage is one way of extracting the equity from your home in order to support your financial needs. Various private, public, and federally-funded entities offer this type of loan, which can be a long-term financial solution in some situations. Learn more about reverse mortgage here. What Do You Mean by "Asset Protection?" Asset protection becomes a crucial issue when you have been admitted to, or need to be admitted to, a long-term care facility. With the costs of long-term care skyrocketing, often topping $5,000 to $10,000 per month, you might suddenly learn that because of the assets you have built over the years, you are ineligible for Medicaid benefits that would pay for nursing home or other types of long-term care. Learn more about asset protection here. Why You Need a Power of Attorney? While everyone knows that it is important to plan for the future, making specific arrangements for a time when you may become incapacitated or unable to make your own decisions. Nonetheless, it is important that you consider this possibility so that the person or persons whom you choose are able to make decisions for you. Learn more about why you need a power of attorney here. Special Needs Child Who Receives SSI is Turning 18. What Should I Do? When a child turns 18, he or she becomes an adult who has the right to make his or her own decisions. However, when that child has special needs or is developmentally disabled in some way, he or she may not be competent to make decisions. In this situation, parents may find themselves unable to intervene on behalf of their children or even help them with medical decisions. Learn more about special needs children receiving social security once they turn 18 here. Every year around the end of December, people in Michigan begin to express desires to change something in their lives. When looking at customs like New Year’s Resolutions, I notice that every one of us has something in our lives we can improve. For instance, you may resolve to eat healthier foods if you have bad eating habits. Learn more about starting a new year with a fresh start here. Following up on our previous blog post concerning joint accounts, I felt the need to warn about some issues involved with the multi-generational joint ownership of real property. A typical situation usually involves a retiree who has children and wants to add the children as joint tenants on the family home to avoid probate. Although this may seem like a good idea at first, such a transaction could have a negative impact in any one of a number of ways. Learn more about multi-generation joint ownership of real property here. Over the past four years, we have been warning Michigan residents about Medicaid Estate Recovery. At our workshops on How to Prevent Your Life Savings from Being Wiped Out by Nursing Home or Long-Term Care Expenses, we raise the topic at every seminar and tell our attendees the following: With the major losses in state tax revenue from individuals who are facing unemployment and foreclosure, the State of Michigan is going to start seeking additional ways to raise revenue to fill the void. Learn more about how estate recovery began it's reign in Michigan here. Following up on our previous blog post concerning joint accounts, I felt the need to warn about some issues involved with the multi-generational joint ownership of real property. A typical situation usually involves a retiree who has children and wants to add the children as joint tenants on the family home to avoid probate. Although this may seem like a good idea at first, such a transaction could have a negative impact in any one of a number of ways. Learn more about how estate recovery may affect more than your home here. A common question asked by many considering creating an estate plan is: What is the benefit of acting today? The short answer is that the laws change and planning opportunities, like many other things, will also change when changes take place in the law. If you plan now, while the laws are still semi-favorable to asset protection, the opportunity to protect your assets is preserved by the current law. However, if you wait and the laws change, your planning opportunities will be affected by the new changes. So, what changes in the law are we as Elder Law attorneys concerned with? Learn more about why financial hardship in Michigan is a reason to plan now here. There are currently more than 65 million caregivers in the United States. As large as that number appears, it is likely that there are even more caregivers than that. Every client who we help usually has several people caring for them. I often ask my clients, "What is being done to help the caregiver?" Caregiver burnout is becoming more and more common with caregivers trying to manage their families and their careers in addition to caring for the loved ones who rely on them. I offer this blog as a testimony to both the support that caregivers provide and the valuable work that caregivers perform on a daily basis. Learn more about the help available for caregivers here. Is it Time to Update Your Old Documents? Many times people will ask me if they need to review the estate planning that they did many years ago. My answer is always the same. You should have your estate plan reviewed every three to five years. They are often surprised that this should be done as often as recommended. Learn more about when it is time to update your old documents here. The Governor of the State of Michigan, Richard Snyder, signed Enrolled Senate Bill 92 recently, which deals with new requirements for durable powers of attorney for finances. The law is PA 2012, No. 141 — and does not apply to a durable powers of attorney executed before Oct. 1, 2012. However, if your durable power of attorney does not meet the new requirements, it would be wise to contact your attorney to execute a new one. One of the new requirements is that in order for a durable power of attorney for finances to be valid, the durable power of attorney must be signed, dated and either (or both) witnessed by two individuals (neither of whom is the agent named in the document) or notarized. Learn more about the law changes for financial powers of attorney here. GRAND RAPIDS, Mich. – The Elder Law Firm PC, an Elder Care law firm that has been serving Michigan retirees in the greater Grand Rapids area for over 18 years, has recently teamed up with Seniors Helping Seniors in an effort to expand their educational outreach program. According to Gregory Hodge, JD, an attorney with The Elder Law Firm PC, the Elder Care law firm's new partnership with Seniors Helping Seniors will allow them to provide an even greater depth of information about in-home care and other long-term care options than their current program, which has consisted of providing free workshops for local retirees at least twice a month for the past three years. Learn more about our law office expaning the educational outreach program here. Our Elder Law Attorneys are often confronted with questions regarding risks to family retirement plans. There is usually great concern over market corrections to a family's investments and tax increases. In both scenarios, the risk involves a portion of the estate that may be affected but there is still a large majority of their estate left in tact. Learn more about managing your greatest risk here. A Medical Power of Attorney, like the Financial Power of Attorney, documents and authorizes a trusted individual to make medical decisions on your behalf when you are no longer able to do so. Although individuals ordinarily use their Medical Power of Attorney to schedule doctor appointments and order prescriptions, the most significant function of a Medical Power of Attorney is as a directive for life-sustaining treatment. Learn more about medical powers of attorney here. When someone decides to contact an elder law attorney to assist them with their eldercare issues, there are usually feelings of reservation. Most often these feelings are related to that person's understanding of the law and their expectations about the attorney. The following information has been provided to help ease whatever reservations you may be having about meeting with us for the first time and to inform you of the processes that we would follow when assessing your specific situation. Learn more about meeting an elder law attorney for the first time here. My Disabled Child is Turning 18. Do I Need a Guardianship? Many times parents have contacted our firm to talk about a guardianship or conservatorship for their disabled child. Many times they don't know if or why they might need to do something, but a friend or school district official has told them that something needs to be done. Learn more about guardianships for disabled children turning 18 here. The Elder Care Attorneys at The Elder Law Firm PC proudly fulfill our mission everyday: To help our clients achieve their estate planning and asset protection goals in times of prosperity, to provide security in times of uncertainty and to offer peace of mind solutions in times of crisis. Learn more about our mission at work here. There is a lot of confusion out there among families and individuals in regards to the difference between Medicare and Medicaid. It can be difficult at times for the average person todistinguish Medicare from Medicaid. Although the names of these two government programs are similar, there are significant differences between Medicare and Medicaid that you need to be aware of. Learn more about medicare and medicaid here. Many individuals believe that joint accounts allow them to avoid probate and transfer money to loved ones, and such accounts are sometimes referred to as 'the common person's estate plan.' But while joint accounts can be useful in certain circumstances, they can have dire consequences if not used properly. Adding a loved one to a bank account can affect Medicaid planning as well as expose your account to the loved one's creditors. Learn more about about the dangers of joint accounts here. Last year, the elder care attorneys at The Elder Law Firm PC conducted nearly 70 seminars throughout the greater Grand Rapids area — speaking to over 1,500 families about asset protection. Our firm assisted over 300 families with creating asset protection plans, and we began posting weekly updates on our website to provide additional information at the click of a button. We are preparing to continue our endeavors throughout 2013 and are looking forward to helping another 300 families protect their assets from the rising costs of long-term care. Learn more about asset protection with our caring touch here. 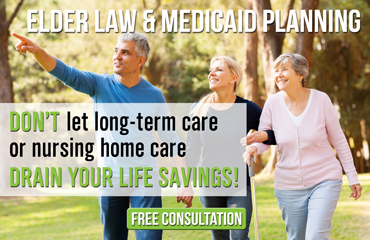 The Medicaid planning attorneys at The Elder Law Firm PC have assisted numerous clients find option to pay for home nursing care though Veteran's programs and private pay. Under some conditions, Medicaid will pay for long-term care services provided in a person's home. Learn more about having your home care paid for by medicaid here. If a loved one is in need of nursing home care, and if they don’t have long term care insurance, their assets will be consumed by such care costs at an rate of about $7000.00 a month — until their assets are almost entirely consumed. However, there are several planning techniques which can utilized to help a loved qualified for the nursing home Medicaid program, which will help pay for nursing home care costs, without having to lose everything first. One such technique which can be utilized by the spouse of a Medicaid applicant is a “Solely for the Benefit Of” Trust (”SBO Trust”). Learn more about medicaid planning with an SBO trust for nursing home care here. Every year the Department of Human Services (DHS) determines the average monthly cost of nursing home care — which in 2012, was $7,032.00. While this number, also known as a Divestment Divisor, may seem irrelevant to most individuals, it is a figure that anyone considering long-term care should know. Additional information about the Divestment Divisor can be found in the Bridges Eligibility Manual (BEM) by clicking here. Learn more about the medicaid divestment divisor increase here. Almost daily, I have clients who mistakenly use the terms Medicare and Medicaid interchangeably. These programs — other than both starting with the letter M and dealing with health care — are completely different from each other. It is important to realize the differences between these programs in order to fully understand the financial impact that the need for care will have on a family and their finances. Learn more about the benefits of medicare and medicaid here. A Financial Power of Attorney authorizes a trusted individual to make financial decisions on your behalf when you are no longer able to do so yourself. Although these documents can be effective immediately, most are drafted to become effective only upon your subsequent disability — when a doctor certifies that you can no longer make financial decisions on your own. Whether it is a physical ailment that inhibits you from making financial decisions or it is a cognitive impairment such as Dementia or Alzheimer's, having a well-prepared Financial Power of Attorney is a must for any individual age 18 or older. Learn more about the financial power of attorney here. A living trust is a legal document that is used primarily to avoid probate and estate taxes. Although a living trust is an effective tool for avoiding probate and estate taxes, it offers no protection against the rising costs of long-term care. So, what does that mean? Learn more about the limited purpose of the living trust here. Do you have a Will that was prepared in 1985? Do you have a document that authorizes someone to act for you whom may no longer be capable of acting on your behalf? Many individuals had their estate plans drafted many years ago and may have even forgotten what they put in it. The estate planning attorneys at The Elder Law Firm PC encourage clients to relax and not worry about their Estate Plans — but to be mindful that as time moves forward and circumstances change, so should their Estate Plan. Learn more about updating your estate plan here. What Is a Conservatorship and Why Would You Need One? A Conservator is an individual appointed by the Probate Court to manage an incapacitated individual’s financial affairs. Many times, someone will need a Conservator because they did not plan for incapacitation or prepare a Financial Power of Attorney. Other times, the planning may have occurred so long ago that a financial institution does not feel safe recognizing the Power of Attorney that is in place. The elder law attorneys at The Elder Law Firm PC have seen the need for a Conservator arise in many people’s lives. Even clients with their Financial Powers of Attorney in place, there are circumstances where clients were refused access to their money when they needed it most. Learn more about conservatorships and why you need one here. This is a critical question that everyone needs to ask themselves. From our perspective as Estate Planning Attorneys, if you do not have an Estate Plan, you have no protection for your specific intentions while you are living or after you die. Learn more about why you should have an estate plan here. The experienced elder law attorneys at The Elder Law Firm PC know that medical issues can quickly devastate a retired couple's finances. When a married couple faces a medical crisis involving one spouse — and that spouse requires long-term care outside of the home — the healthy spouse faces the risk of a dual cash flow crisis. A dual cash flow crisis emerges when the monthly expenses of a couple continue as normal, but there is an additional expense for skilled nursing care. Often, over the course of only a few years, the healthy spouse ends up spending most of the couple's retirement assets to pay for the costs of long-term care. The result is impoverishment for the healthy spouse, who is left with little to nothing to support normal living expenses. Learn more about the dual cash flow crisis here. Financial contracts to care for sick or aging relatives — nearly unthinkable just a decade ago — are drawing new interest as everyday Americans wrestle with the time and expense of providing long-term healthcare for their relatives. More Americans are considering the agreements as a result of tougher standards imposed three years ago for Medicaid, a government program that covers nursing home care and other long-term healthcare costs after older Americans have exhausted their own assets. Learn more about using your family to provide long-term care here. The number of unpaid family caregivers in the United States now tops 65 million — according to Caregiving in the U.S. — citing a 2009 report conducted by the National Alliance for Caregiving in collaboration with AARP. Learn more about the silent caregiver here. At the start of every year, the elder law attorneys at The Elder Law Firm PC receive multiple questions from existing clients who are receiving Veteran's Administration (VA) benefits as either a wartime veteran or a surviving spouse. Most of these clients have recently received an EVR (Eligibility Verification Report) from the VA. Learn more about EVRs here. In December 2012, the Department of Veterans Affairs sent out notifications explaining that the Eligibility Verification Report (EVR) is no longer required to be completed annually. Prior to this change, VA beneficiaries had to file an EVR every year to disclose income, assets and medical expenses. Although this determination will reduce the annual reporting burden that has created a number of issues in the past, it is important to note that significant changes in your income, assets or medical expenses still need to be disclosed to the VA. Learn more about the EVR reporting process changes here. This is an update regarding the most recent increase in the maximum benefit rates for Veterans and their surviving spouses who are receiving or are expecting to receive assistance from the Veterans Aid and Attendance Program. This program is a non-service connected pension for Veterans and their surviving spouses. If the Veteran served 90 days active duty and one of those days was during a congressionally declared period of war, then the Veteran and their surviving spouse are eligible for this benefit. Learn more about the maximum rates for the VA benefits increase here. If you are a war-time veteran or the surviving spouse of a war-time veteran, there may be a benefit available to you from the federal government to help cover the costs of long-term care, — either at home or in a facility. The Veteran’s Aid and Attendance benefit, a non-service connected benefit, pays veterans up to $1,949 a month and their surviving spouses up to $1,056 a month toward the cost of long-term care. Learn more about veterans benefit aid and attendence here. The Social Security Administration recently announced they have added early-onset Alzheimer’s to the list of conditions under their Compassionate Allowance Initiative. This is a great help for younger individuals afflicted with this debilitating disease — giving them expedited access to Social Security Disability Insurance (SSDI) and Supplemental Security Income (SSI). Learn more about Alzheimer's disability payments that are available here. If you are married, your spouse is automatically entitled to every dime in your 401(k) account when you die, regardless of what your Will says or who you designated as the beneficiary of that account. In fact, in most cases, your spouse becomes the sole heir to all of your 401(k) accounts on the date of your marriage. Learn more about why having a will is not enough here.